Tire Stickers are available in a variety of colors for each product type. Short Term tire letter kits colors include: white, glow-in-the-dark, blue, red, green, orange, yellow, neon yellow, neon green, neon orange and neon pink. Permanent raised rubber lettering kits are available in white, red, yellow and neon green. 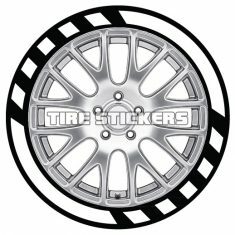 We also offer custom multi-color designs to match custom PMS colors for larger quantity Tire Stickers orders. One of the biggest risks of damage to your Tire Stickers is ordering too large for the tire sidewall surface. The tire has a designated tread bead and inner bead that defines the tire sidewall surface, this is the ‘safe area’ for application of tire letter kits. 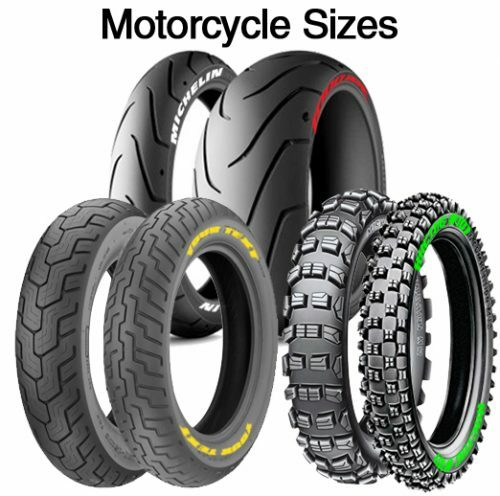 Sportbike and off-road motorcycle tires have a standard size, so don’t worry about selecting a tire letter height! There are two methods of determining the proper fitment for your tire: Measure the sidewall surface with a ruler – Be sure to measure the sidewall, NOT the entire surface from tread to wheel! If you have any doubt, send us a photo! Generic Tire Sizing guidelines – Use the generic tire sizing chart below to guide your decision or our Decal Height Calculator located on each order page. Identify the aspect ratio or series (generally the middle number of the tire specification) and match to the chart. Note: some tires may have a unique aspect ratio outside of these guidelines, when in doubt email us! Our Short Term Peel and Stick product is designed for car shows, photo shoots and races (sprint, drag, endurance, time attack, etc.). It is quick and easy to apply and meant to be disposable after a few hundred miles of driving your tires. Our Permanent Raised Rubber Letter kits are designed for daily drivers and long term durability. These decals are meant to last the lifetime of the tire and are completely cleanable!